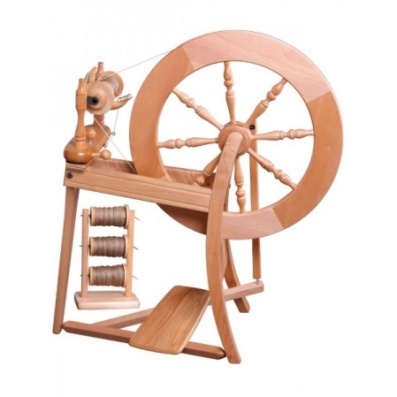 The most popular design in the world, the Traditional will give you a lifetime of spinning. Why is it so popular? The separate drive band and bobbin brake adjustment is easy to understand and simple to operate. The bobbins are quick and easy to change. Scotch tension and 3 speed flyer allow for a wide variety of yarn to be spun. Horizontal adjustment of the maiden bar allows perfect alignment with the 3 speed whorl. Ball bearings and large (22ins) wheel makes treadling smooth and effortless to maintain a steady speed. The wide legs give good stability especially when treadling at speed. The treadle is pivoted to allow a comfortable heel-toe action. Once you have an Ashford Traditional you dont need to "upgrade" it will do everything with the addition of the optional flyers except the very super thick yarns. We often hear comments on starting with an Ashford then moving up to a better wheel. This we consider a to be a nonesense comment as the Traditional will do all you need.